Newark's political center, since the city's earliest days, has always been town hall, later city hall. In the 17th and 18th centuries, Newark's township form of government was relatively simple. It was based on a New England form of government that convened only occasionally and required little in the way of a meeting place. As a result, there was no real need for an elaborate government building. In fact, churches, markets and even taverns and hotels served this function for 170 years. Both the second and third structures of Old First Church were used, as was the Roff House and Archer Gifford's Tavern. At one point the Third Presbyterian Church hosted the government, and later the old Market House served the same purpose. After incorporation as the city of Newark in 1836, a more formal building was required for the seat of government. Consequently, the council met in the lodge room of Newark Academy. The Park House was briefly called into use, but by 1838 the Egyptian-style Essex County Courthouse was shared by Newark and Essex County. This was the home for Newark's government from 1838 until 1848, when it too was outgrown. From 1848 to 1854, City Hall was relocated to Newark's Library Hall. In 1864, it was moved again, this time to the second floor of the old Centre Market, which stood on the Morris Canal at Broad Street. With the coming of the Civil War, Newark's government again outgrew its home and was no longer prepared to rent temporary quarters. By then, Newark was a full participant in the United States industrial revolution, and the rapidly growing city had need for a wide array of new government services that required a modern municipal building. The time had come to own the seat of government, which resulted in the purchase of the MacGregor House at Broad and William streets. John Cunningham's 1966 Newark history described the city's various homes prior to this period as 'wanderings from place to place.' To remedy this, a committee chaired by Judge Herman Schalk was appointed to search for a permanent home. It decided to purchase an existing building and to renovate. The committee selected the MacGregor House, also known as Stuart's Hotel, at William and Broad streets. During the Civil War, this was one of the city's best-known hotels. Architect A.C. Neumann remodeled it to accommodate the city's needs. He filled the basement with a variety of municipal offices, placed the mayor, treasurer, city dispensary and police court on the first floor and moved the council onto the second floor. A newspaper account of the time described the building: 'The Common Council Chamber is however the most notable feature of the building. This is on the rear of the second floor, 51 feel wide and 65 feet long, and absorbs the space formerly occupied by the stories which have been taken out leaving a high ceiling at the roof which is supported by ornamental iron columns, and affords ample space for galleries which extend around three sides of the chamber. The platform upon which the members' desks are placed is raised three steps above the main floor, and enclosed with an iron rail, the lobby outside being convenient for spectators, about 600 of whom find places there in the gallery.' The ceiling and walls have been handsomely ornamented on fresco by Mr. Albert Metz, and the furniture, including desks and seats for the officers and members of the Council, are of black walnut, elaborately carved, and upholstered with blue cloth. The floor is carpeted with English Brussels of a Turkish pattern.' Improvements have been substantially made under the direction of Mr. A.C. Neumann, the architect, Mr. T. Wiedenmayer was the carpenter and Silas M. Todd, the mason. The plumbing and heating works were made by Green, the ironwork at Ward's foundry and furniture by Jelliff. 'The cost of the alteration to the main building with furniture, etc., was $40,000; and the new police station and prison $20,000. Adding $31,000 to the original purchase money will bring the entire cost of the establishment up to $93,000.' At last, by 1864, Newark had its own home, where it remained until the completion of the current City Hall in 1906. 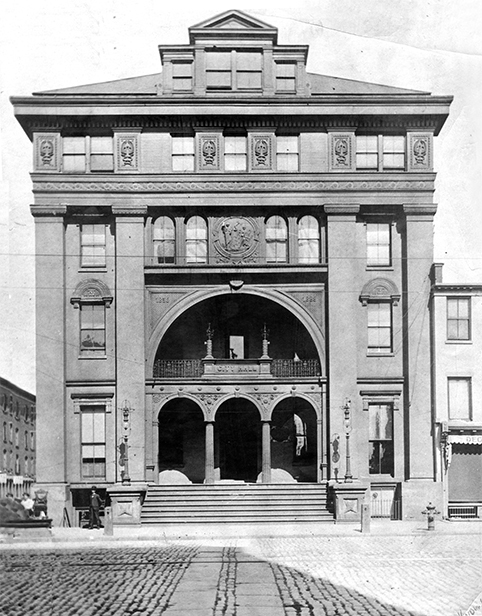 At the close of the 19th century, Newark again had outgrown its meeting place, and it was decided to replace its first city-owned building with a newer and larger structure. Newark now ranked as a major American city and required a city hall that would serve a modern urban center. Consequently, a building committee was appointed that included Newark notables Andrew Kirkpatrick, Gottfried Krueger and James Howell. By 1901, the committee produced a publication titled 'Conditions of Competition for a Building of a City Hall.' In essence, there was a call for a new, not a renovated building, and the suggestion that the commission have an open competition for a building architect. Five finalists were to be paid $1,000 for their plans, and one was to be selected by an outside jury to design the new building. Strict standards for the new building indicated that it be fireproof and constructed of brick, stone, granite and marble. It was to be four stories with a cellar and basement and was to be fitted for both gas and electricity. It was to be constructed to allow for additions and enlargements, and 'care was taken in planning the building as to avoid sacrificing utility and convenience to architectural effect.' By far the most important space was allocated for the Common Council Chamber, an area totaling 500 square feet. Included was an office for the council president and three meeting rooms. The building costs were to be taken care of through a bond issue and the sale of various pieces of real estate no longer in use. Real estate assets disposed of included the Old Burying Ground, the former Poor Farm, the Boys' Lodging House on Market Street and the old fire headquarters at Academy and Halsey streets. Nearly $600,000 was needed to acquire the building site, which was on Broad Street between Green and Franklin streets. Once this was done, construction began on August 18, 1902, and the cornerstone laid on August 5, 1903. For the next four years, work continued, despite slowdowns and strikes, and the 'city palace' was completed and ready for opening on December 20, 1906, when the keys to the new building were turned over to the city. The architects of the new City Hall, John H. and Wilson Ely, were selected from a group of 75 applicants to design the new building. While son Wilson Ely was born in Trenton, he spent most of his professional career in Newark, and is considered by many to be one of the city's finest architects. In addition to City Hall, he designed other important landmarks including the National Newark and Essex Bank, the American Insurance Co. and the Howard Saving Institution. Ely's design of the functional yet traditionally classical building represented the biggest challenge to the architect. His city hall building site was 240 by 140 feet. The building was to be a four-story Beaux Arts classical structure topped with a dome 97-feet high from the sidewalk and featuring an interior rotunda finished in fine Italian marble. Just how much Ely's influence was felt in Newark was summarized in his Newark Evening News obituary, which stated that 'No man has had a greater influence than Mr. Ely in the changes which have transformed the appearance of downtown Newark during the last 30 years.' Certainly the classical skyline of Newark would not have been as rich if there had never been an Ely. His great structures probably will last as long as there is a city. The contractor selected to build City Hall was E.M. Waldron, born in County Mayo, Ireland, in 1864. He came to the United States at the age of 16 and was first employed as a weaver in a Canal Street hosiery mill. Later he was apprenticed to a bricklayer at Riker and Polle, and by 1888 had established the firm of E.M. Waldron with his two brothers. Waldron was married twice. His first home was at 208 Mt. Pleasant Ave. – Cockloft Hall, formerly the summer residence of Washington Irving. After the death of his wife, he moved to the Roseville section, starting a new family and establishing a reputation as a generous host. He was involved in all types of local activities, ran unsuccessfully for mayor and was an official in a local bank and insurance company. But he is best remembered as one of New Jersey's finest builders. Most of Waldron's work was done here in Newark and Essex County, but the greatest monuments to his professional abilities are Newark's Sacred Heart Cathedral and City Hall. Over the years, the City Hall building has been constantly updated, but its basic structure remains the same, with its monumental proportions, its grand staircase, its soaring rotunda, its recently reconditioned exterior light posts on the front steps, and the attractive gardening around the outside, which shows somebody cares about the building and the activities within.